Tags: bw2, halloween, winners, contest, mansion, 2018. 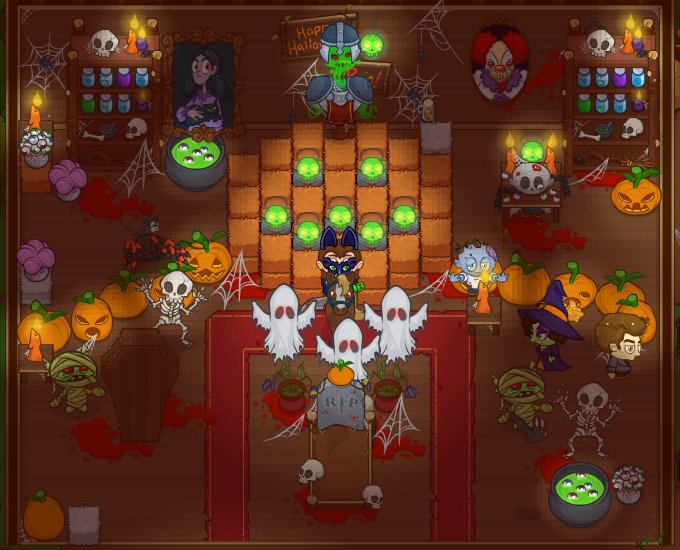 We've chosen our 2018 Halloween Decoration Contest Winners! If you weren't aware, the 1st, 2nd, and 3rd place winners are picked by the whole Codename Entertainment studio, while Community Choice was voted on by you, the wise Whacker community! Our top three choices earn 250, 200, and 150 Bush Bucks respectively, while the Community Choice takes home a cool 50 Bush Bucks. Congratulations again to all our winners! Your Bush Buck prizes have been added to your accounts! Tags: event, new content, halloween, emo, crusaders, update. Under full moonlight, you see a sight that almost stops your heart! Wait — this thriller-night has happened three times before! And it's back again tonight! Emo's New Moon has returned, bring ghosts and ghouls to the neighborhood schools where Crusaders fight for their lives from now until November 6th at noon Pacific! 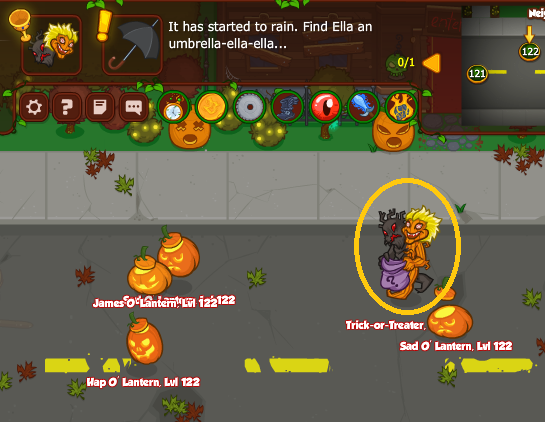 Emo's New Moon 4 introduces Trixie the Treater, the latest Tier 4 Crusader, and brings back Viktor the Vampire, Henry, the Scaredy-Ghoul, Fright-o-Tron 4000, Wendy the Witch, and Jack O'Lantern! Trixie the Treater is a Support/Gold Find Crusader who buffs the formation the more varied and different every Crusader in it is. When you unlock her, she swaps with The Exterminator and Gloria the Good Witch. Trixie also takes her trick-or-treating very seriously, which is great news for her fellow Crusaders because she brings home the Gold! If you haven't collected them already, you can unlock previous Tier 1, Tier 2, and Tier 3 Crusaders by completing their respective objectives. 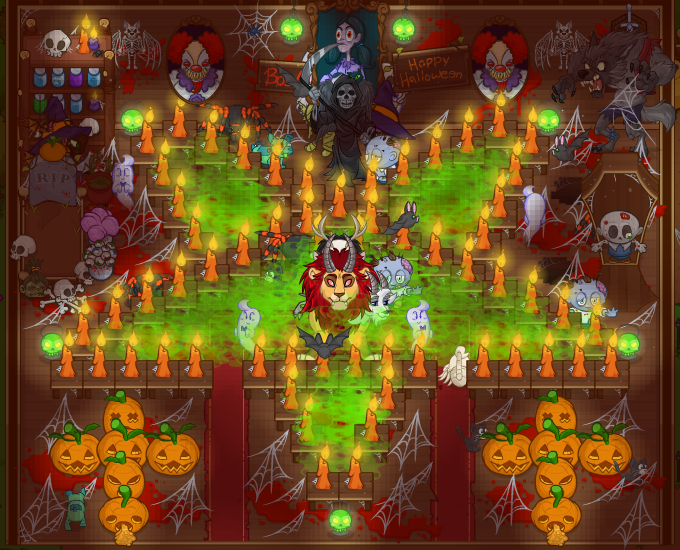 Viktor the Vampire, Henry, the Scaredy-Ghoul, Fright-o-Tron 4000, Wendy the Witch, and Jack O'Lantern are all once again available to unlock! Recruit Trixie the Treater | Trixie the Treater takes up a slot in your formation. She steals some of the quest items that drop. Crusaders in other columns deal no DPS. Reach area 600. Carved Out | Three central formation slots are unavailable. Pumpkin seeds fall on random Crusaders, damaging them. Reach area 700. Masquerade | For the purpose of Formation Abilities, Crusaders have no tags. Reach area 750. Darkness Rising | Only undead, demon, and magic Crusaders may be used. Reach area 800. Wait Up | DPS done to monsters is equal to the lowest DPS in your formation. This does not include click damage. Reach area 1000. Introducing an All-New Event Mechanic! That's right! We've added a new mechanic to events, to help you with Idol collection. For all the areas on an event objective or event free play that players complete, you can contribute to an additional bonus Idol buff that gives you more Idols on the event! 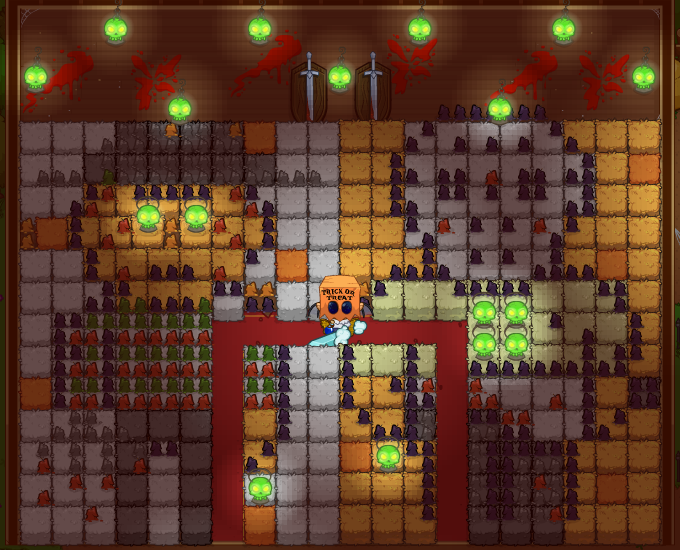 The more areas completed by all players, the larger the buff! We hope you'll enjoy it! And don't forget to check the in-game change log for what else is included in this update! 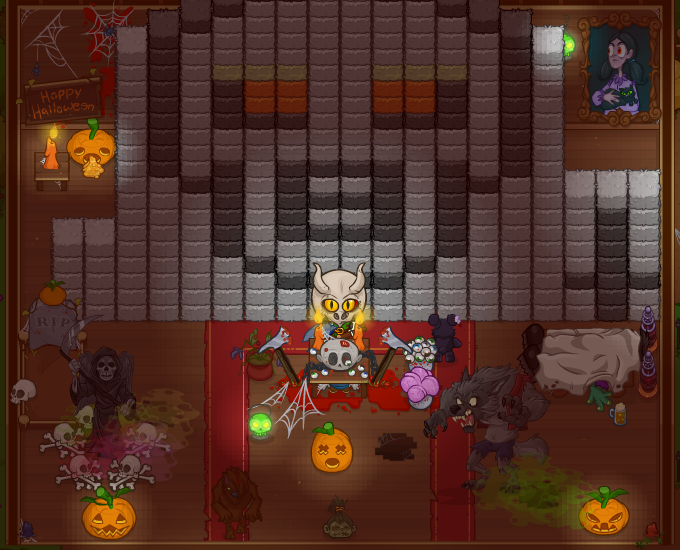 Equipment for event Crusaders can be found in Silver and Jeweled Halloween Chests, which you can earn from objectives and the free play or buy in the shop. Each non-recruitment objective will drop a chest for its given tier of Crusaders, and free play will drop all-tier chests. Gear for Tier 2, Tier 3, and Tier 4 Crusaders will only appear in all-tier chests once you've unlocked the respective Crusaders. You can select the tier of chest you buy in the shop. You'll have until Tuesday, November 6th at 12:00pm Pacific to complete Emo's New Moon 4! BW2: Halloween Event, 2018 Edition! Tags: bw2, halloween, event, update. 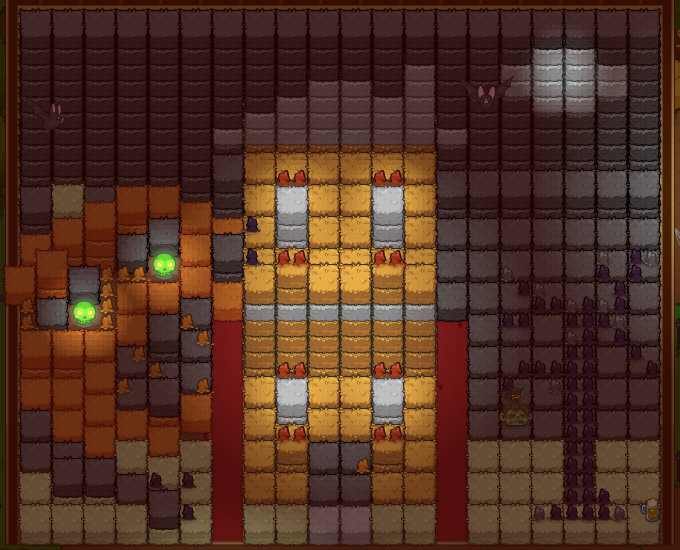 Halloween is Coming to Bushwhackia! 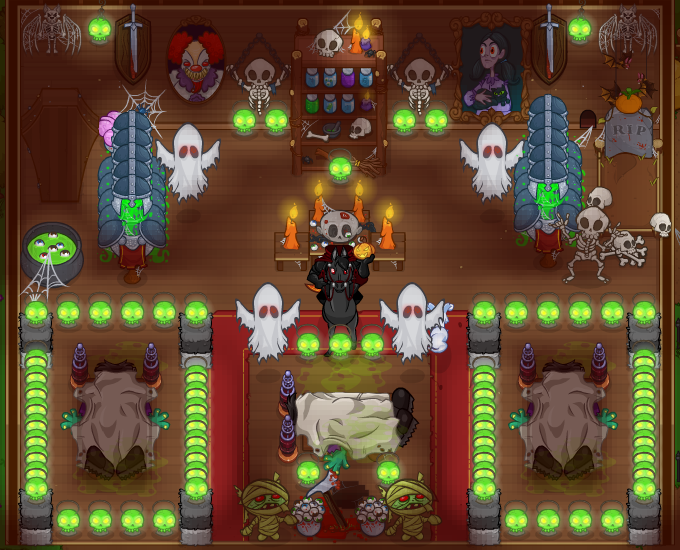 You do not have to place all your collected decorations on display in the Mansion in order for them to count towards "Halloween Collector," they will count so long as they are within your haunted house inventory. The goal is to scare the pants off the 8 children standing in front of the house, all of varying levels of bravery. The more you scare them, the more candy you'll earn in return. And you're going to want that candy so you can trade it for the custom items at the event store! You can try scaring them every 20 hours after you scared them the first time. Glenda the Good Witch isn't just for buying decorations with Pumpkins. You will also be getting several quests from her throughout the event for special interactive decorations. As you complete each of her four quests, you can request help from your friends* by talking to the Construction Worker to increase the decoration's scariness. *Platforms which do not support Friend Lists will have an adjusted static scariness. The Haunted Mansion Photo Contest will be starting soon! What can possibly make your house scarier? 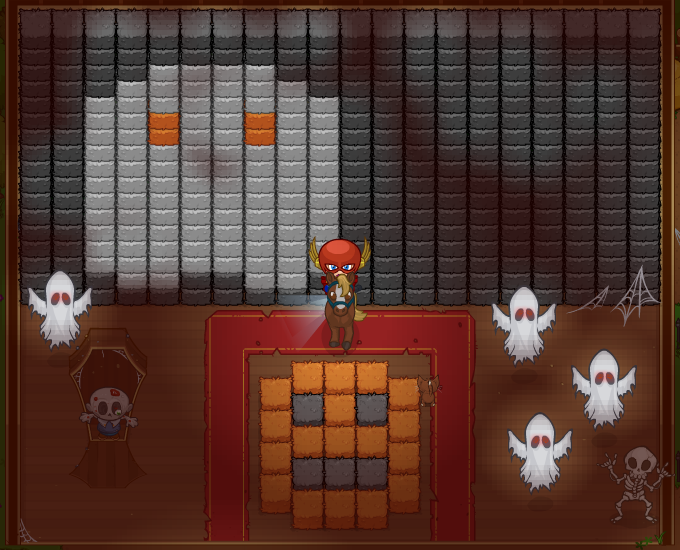 How about some Creatures which wander around your mansion! Each creature will become available for a set amount of dates which you can then request from friends* by talking to the the Cop. *Platforms which do not support Friends Lists can receive a single creature for free as they become available, by speaking to the Cop. 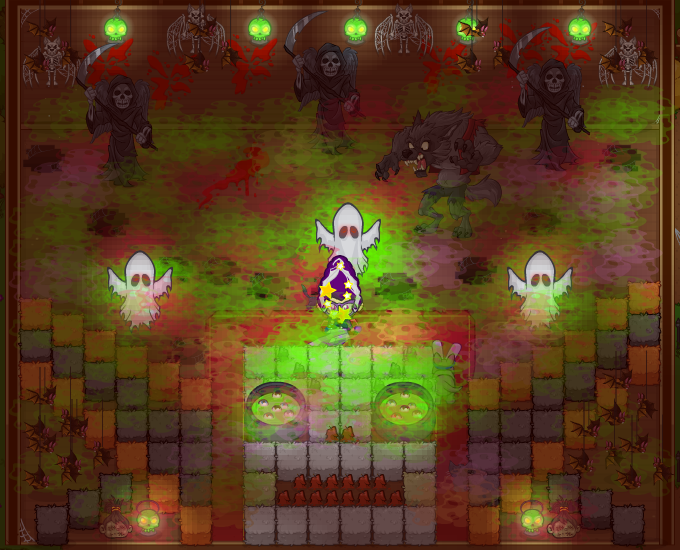 The Sparkly Vampire is still available for Bush Bucks if you want it in your haunted house. To buy the custom items, you need your Candy! Not only do you get it from scaring those insolent little kiddies, you also net some from completing the various quests given to you by the Halloween NPCs hanging out in the event area! Plus from Wednesday October 31st until the end of the event, you can hunt down denizens of Bushwhackia and Trick-or-Treat with them for Candy goodness! 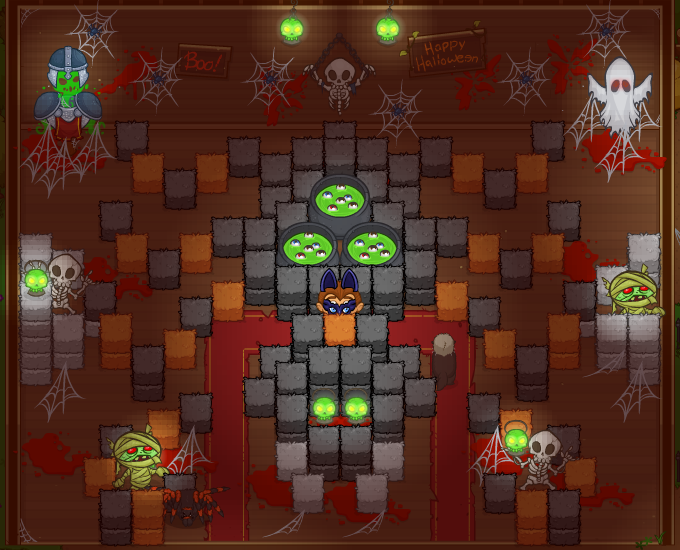 There will be a spooky character standing in front of a pile of Candy in each of the major areas! So 1 in the Mysterious Forest, 1 in the Shady Detour, etc. 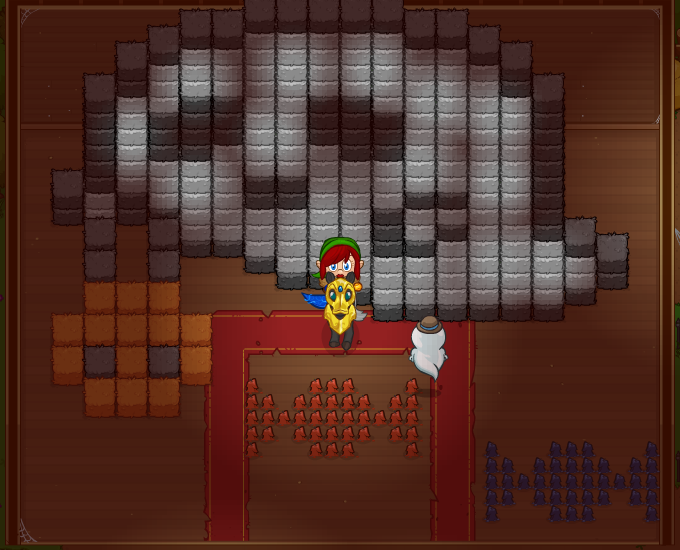 NPCs have been added up to the Spine of the World! We've added five new quests for this year! Enjoy! 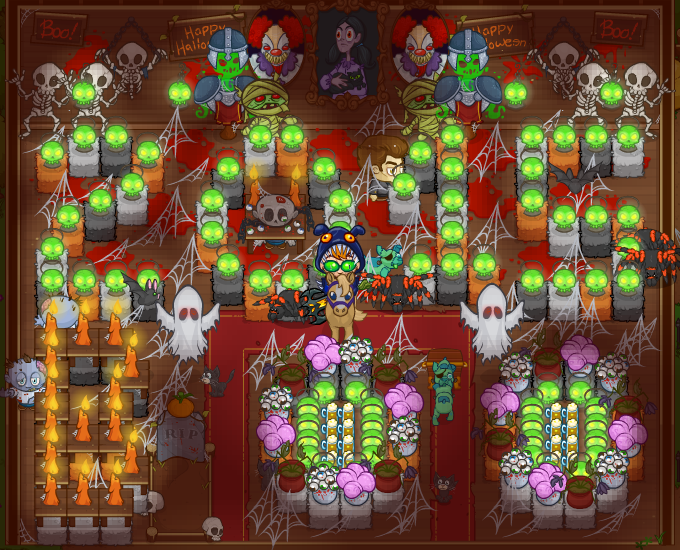 Mansion Maniac - Get 50 decorations for your Haunted Mansion! Scarred for Life - Scare all the kids in your Haunted Mansion! Trick or Treat - Go Trick or Treating on or after Hallowe'en! 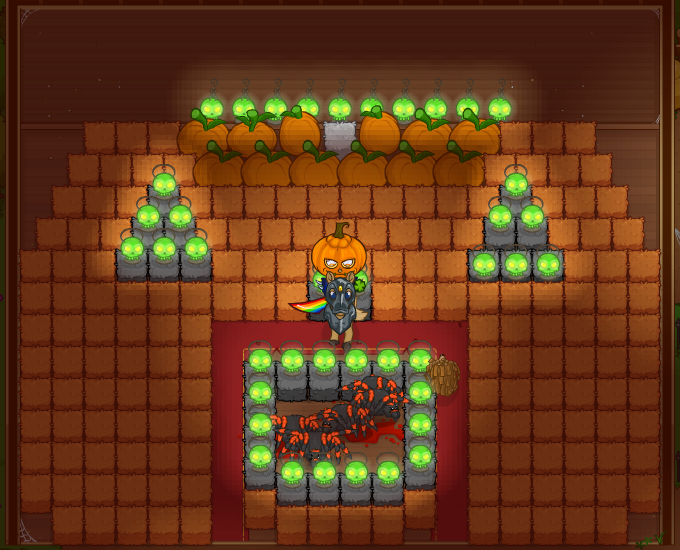 Pumpking - Grow a very large Pumpkin. 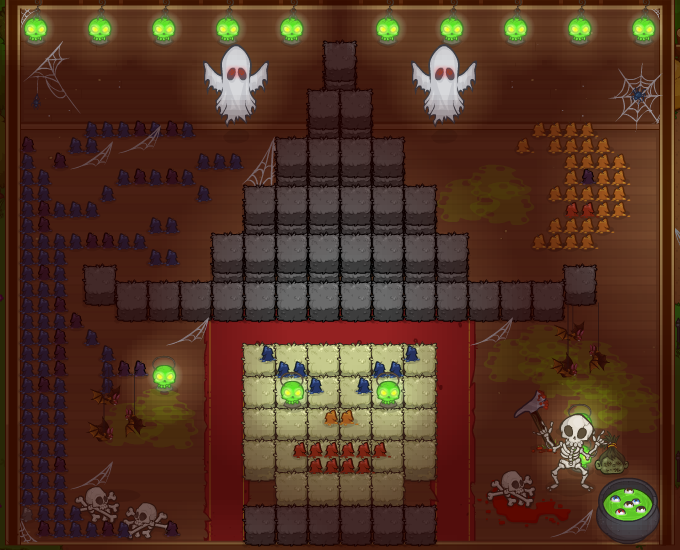 There's a Skeleton in Us All - Help The Bone Doctor build and animate a skeleton for Halloween! Ghastly Grabs* - Purchase all the 2018 Halloween Event items. 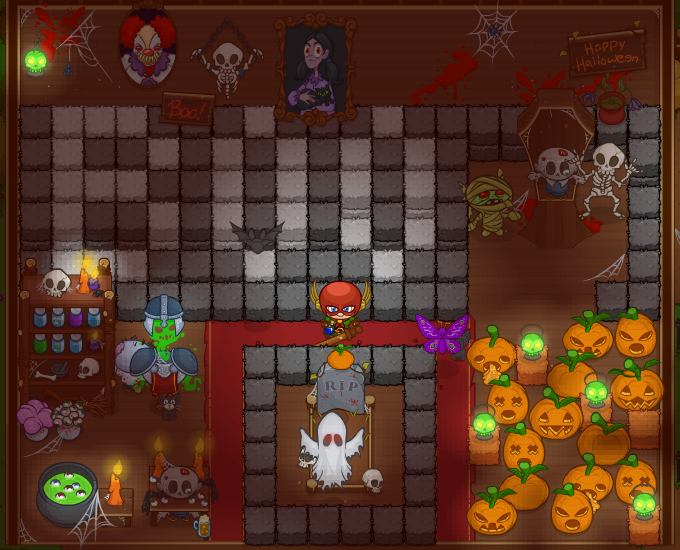 Spooky Home Decorator - get all house items from the 2012 Halloween Event! 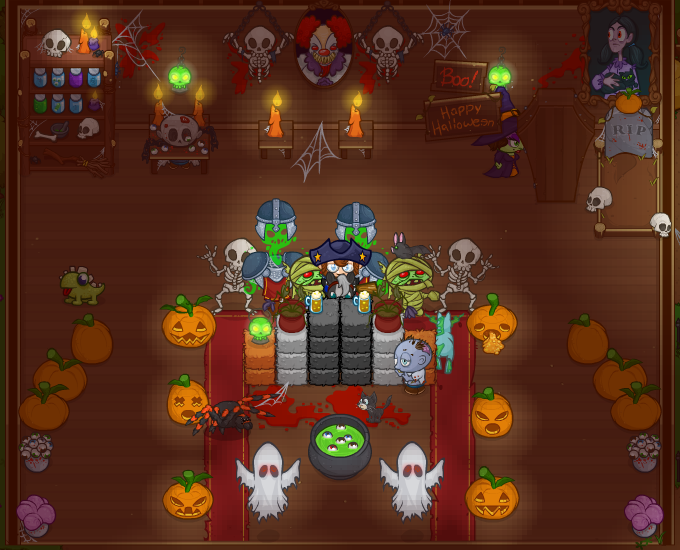 Year-round Cosplayer - Get all player items from the 2012 Halloween Event! 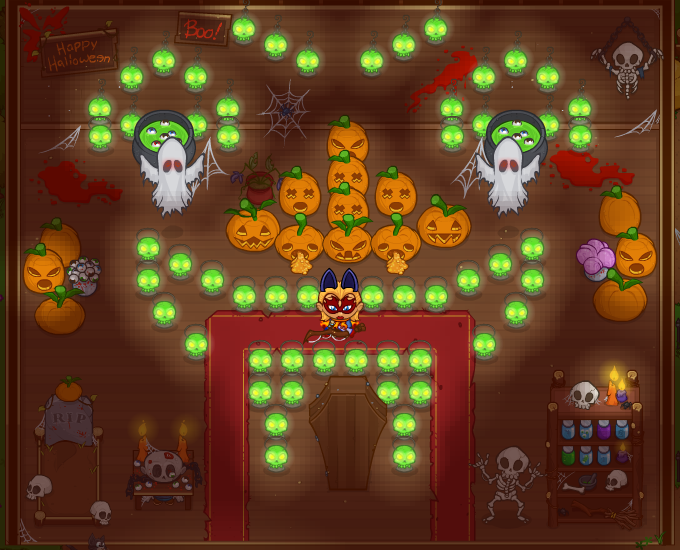 Candy Spender - Purchase all the Halloween 2013 items! 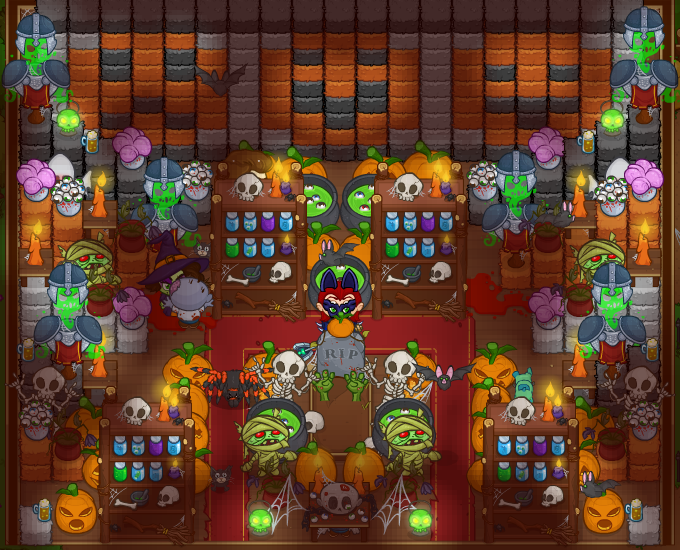 Spooky Purchases - Purchases all the 2014 Halloween Event items. 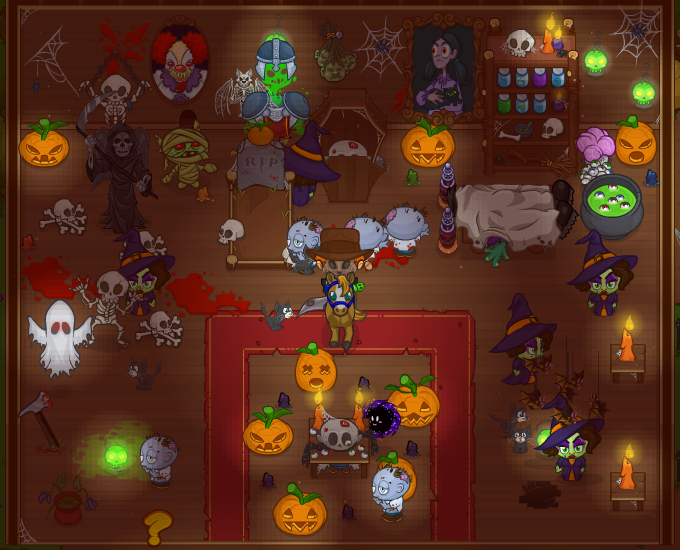 Halloweenie - Purchase all the 2015 Halloween Event items. 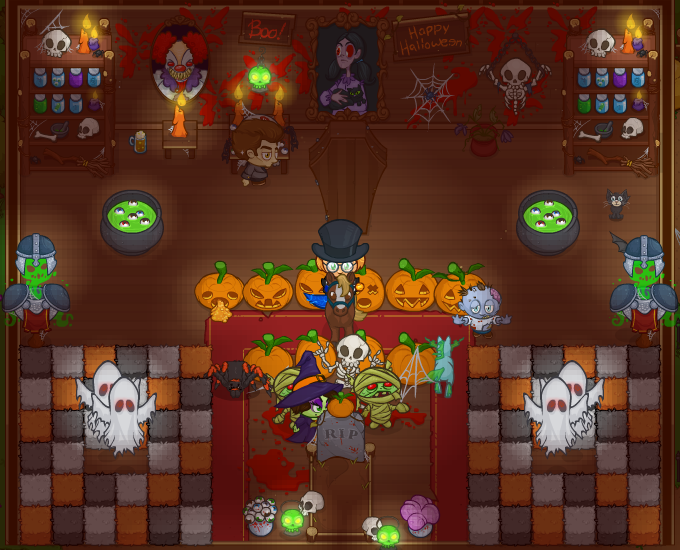 All Hallows' Items - Purchase all the 2016 Halloween Event items. Scary Swag - Purchase all the 2017 Halloween Event items. 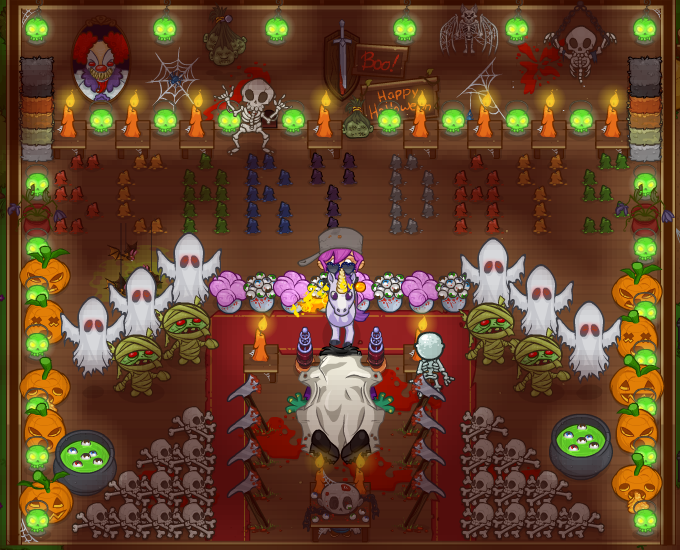 *The Halloween Mini Golf piece is NOT included in the Ghastly Grabs achievement, and therefore it is not required to purchase it. Grab Your Spooky Companion for Bush Whacking! Pet Packs for 2018- COMING SOON! 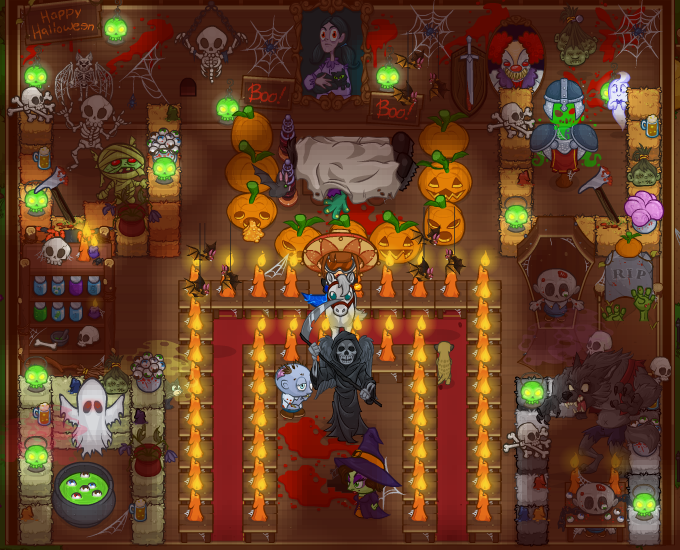 Post your Halloween scariness and questions on the forum! The event will run until Friday November 2nd at Noon PDT! Have a treat! Redeem SPOO-KTAC-ULAR-2018 for 1 Large Energy Pack. Valid until the event end. How can I find the Pumpkins? Just keep whacking. The Holiday Item runes and pets will help attract them as well. 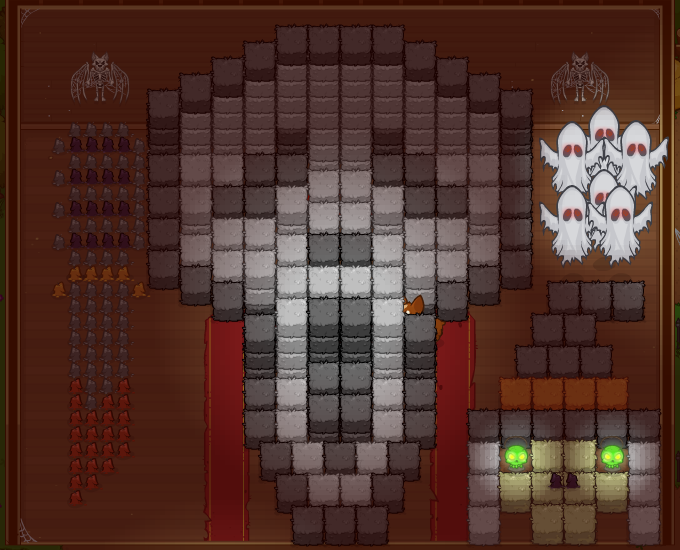 How do I decorate my Mansion? You need to whack up Pumpkins. 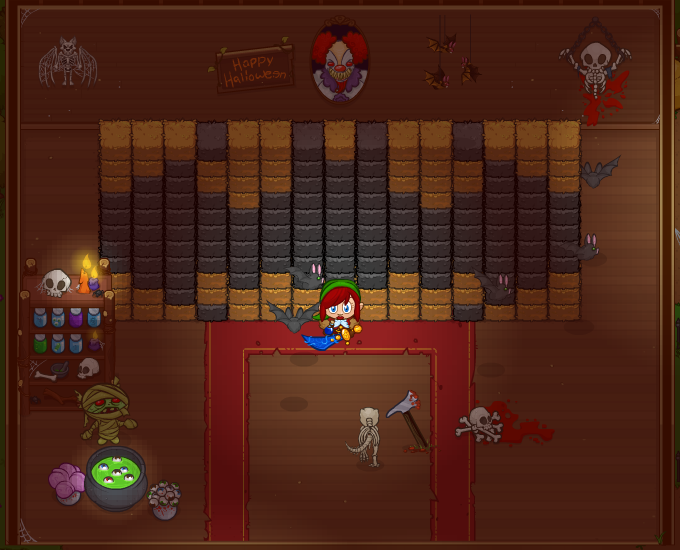 You can buy decorations from Glenda in the event area, or from the Store when you're in Build mode inside the Mansion. 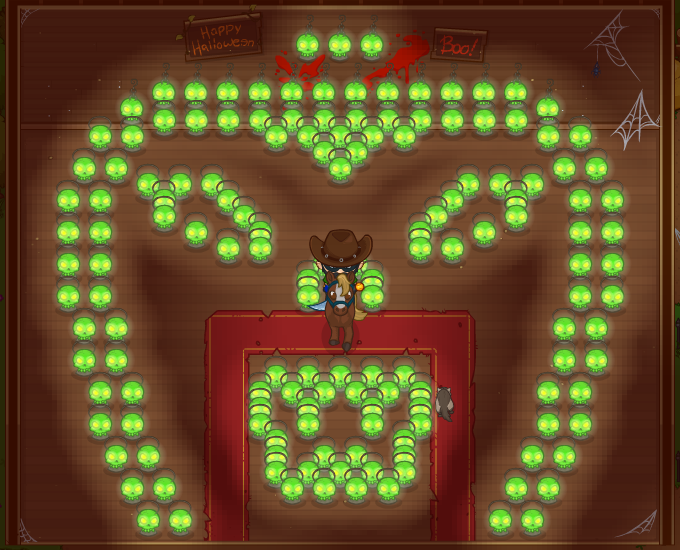 Once you have decorations, you can place them like you're decorating your ranch using Build mode. How do I scare the Kids? 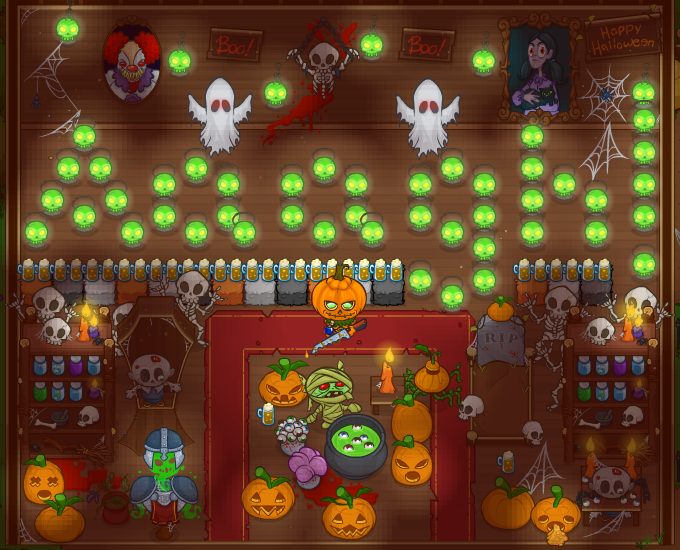 Just keep buying decorations and getting friends to up the scare level of your interactive decorations. 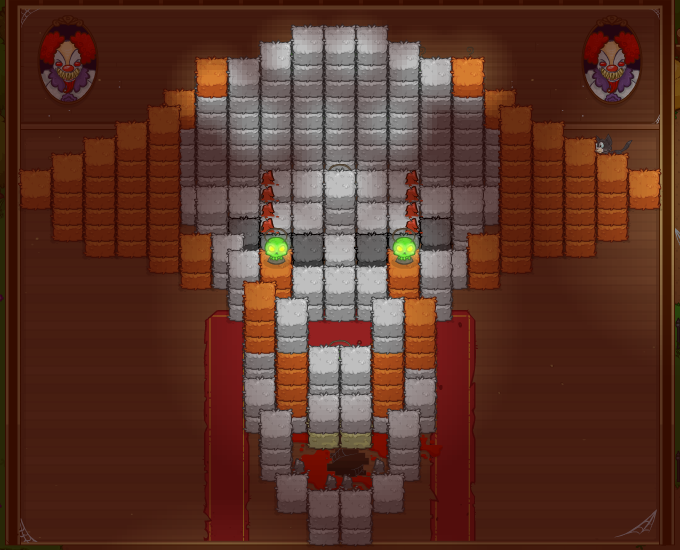 As your event progress increases, you will scare the kids more and more. As well, when you reach a certain level of scariness, the kids will elect to no longer tour your house. Does the Timey-Wimey watch or Time Turner affect the Kids? No, the kids do not have quest cooldowns, so trinket effects that work for quests will not apply to them. 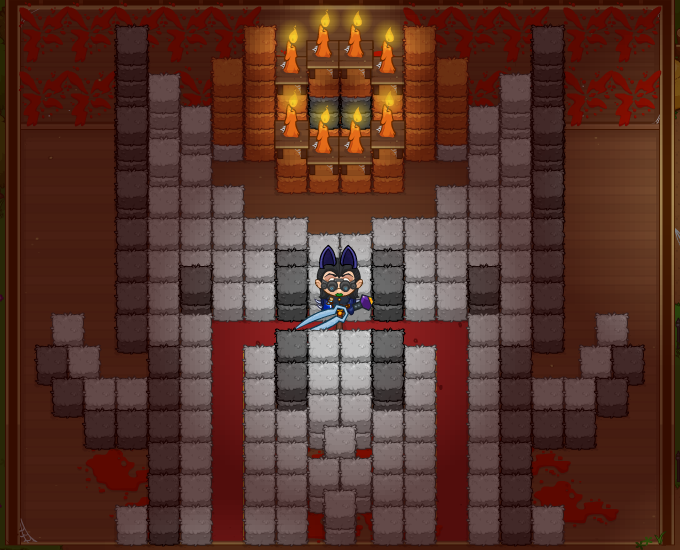 Tags: bw2, halloween, winners, contest, mansion. We've chosen our 2017 Halloween Decoration Contest Winners! If you weren't aware, the 1st, 2nd, and 3rd place winners are picked by the whole Codename Entertainment studio, while Community Choice was voted on by you, the wise Whacker community! Our top three choices earn 250, 200, and 150 Bush Bucks respectively, while the Community Choice takes home a cool 50 Bush Bucks. Tags: event, new content, halloween, emo, crusaders, update, vampire. Emo's New Moon, Year 3! Today we unveil our second Tier 3 event: Emo's New Moon! This year's event update includes a very unique new Crusader, Viktor the Vampire, whose support abilities are based upon the tags of those around him. We hope you enjoy him, and the 4 other new objectives available this year! Emo's New Moon runs until Tuesday, November 7th at noon PST. For more information, check out the How to Play / FAQ in-game! Viktor the Vampire is a buffer that converts adjacent Crusaders into vampires, granting them supernatural abilities and additional effects. If you haven't already collected them, you can unlock our Tier One Crusaders Wendy the Witch and Jack O' Lantern by completing the respective 2015 objectives. 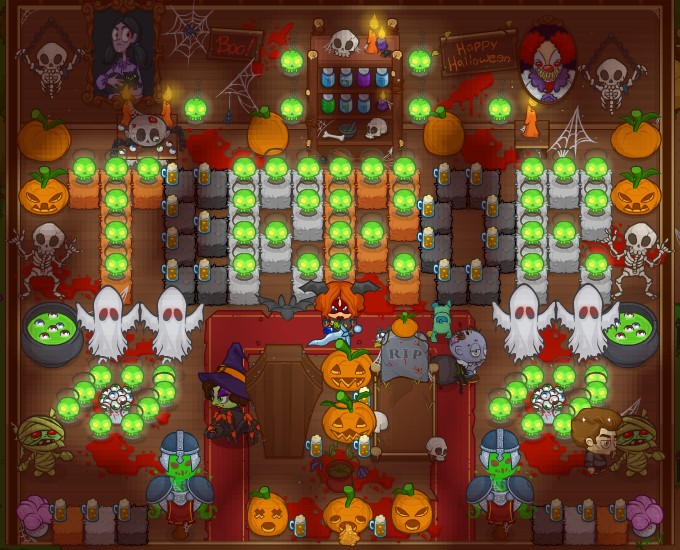 Then, you can collect the Tier Two Crusaders, Henry, The Scaredy-Ghoul, and Fright-o-tron 4000 and Development by completing the first two Tier Two objectives! Four New Tier 3 Objectives! Bloody Mess | Every time a monster is killed, it leaves a blood puddle on the ground which slowly creeps towards the formation, dealing damage to the front-most Crusaders for 25% of their max hp. Reach area 600! Witching Hour | Three witches on brooms take up three slots in your formation, debuffing the DPS of adjacent Crusaders. Every 100 areas they change positions. Reach area 650! 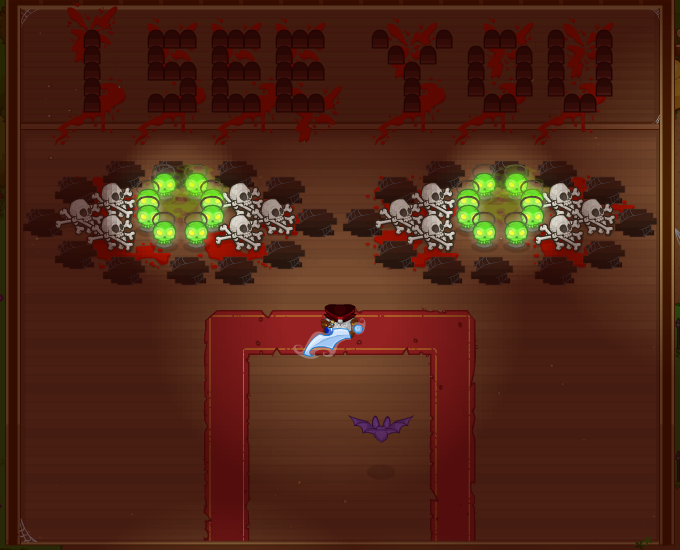 Infection | Every time you enter a non-boss area, one random Crusader in your formation gets an Infection, causing them to do no DPS and disabling their Formation Abilities. Every 6 seconds, the Infection spreads. Reach area 700! 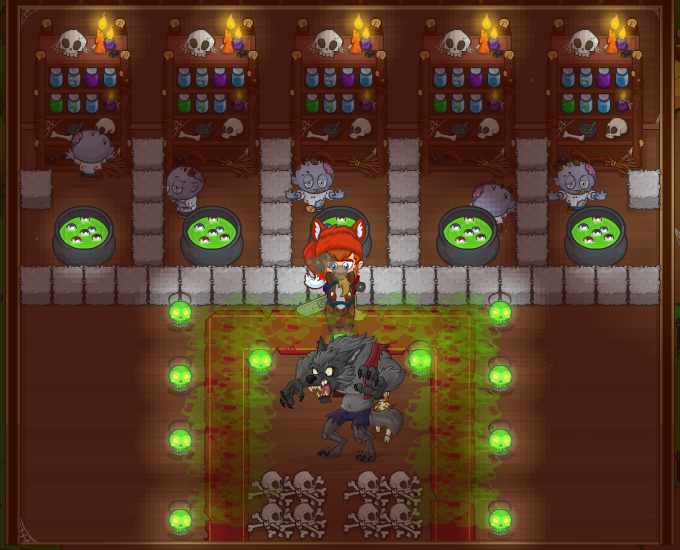 Full Moon | Every 50 Areas the DPS of all Crusaders is reduced by 75% (multiplicative), except for Emo Werewolf, whose DPS is increased by 25% (multiplicative). Reach area 750! 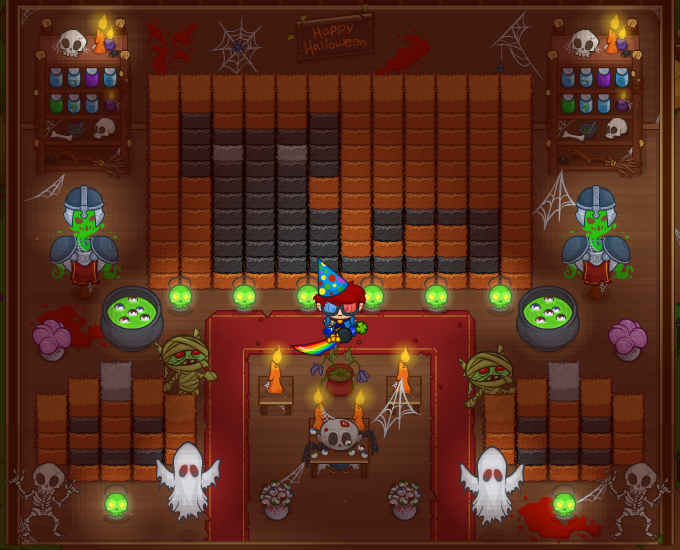 Equipment for event Crusaders can be found in Halloween Jeweled Chests, which you can earn from objectives or buy in the shop. Each non-recruitment objective will drop a chest for its given tier of Crusaders and free play will drop all-tier chests. Gear for the Tier 2 and 3 Crusaders will only appear in all-tier chests once you've unlocked the respective Crusader. You can select the tier of chest you buy in the shop. You'll have until Tuesday, November 7th at Noon PST to complete Emo's New Moon this year! Tags: event, bw2, halloween, 2017, update. 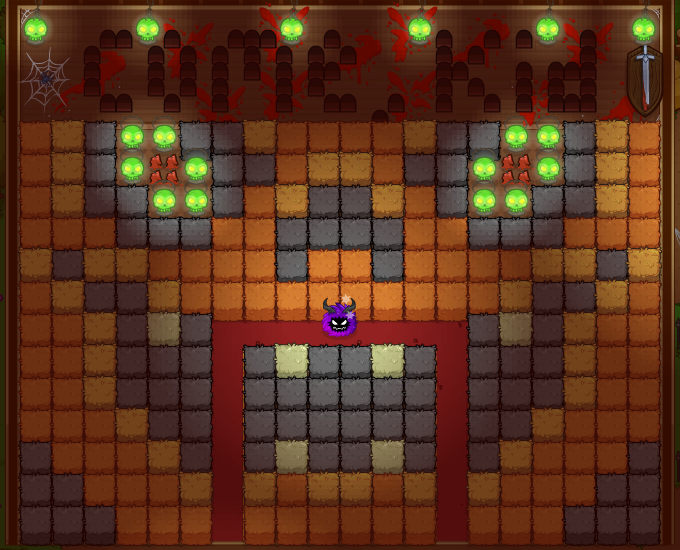 Hallowe'en is Coming to Bushwhackia! 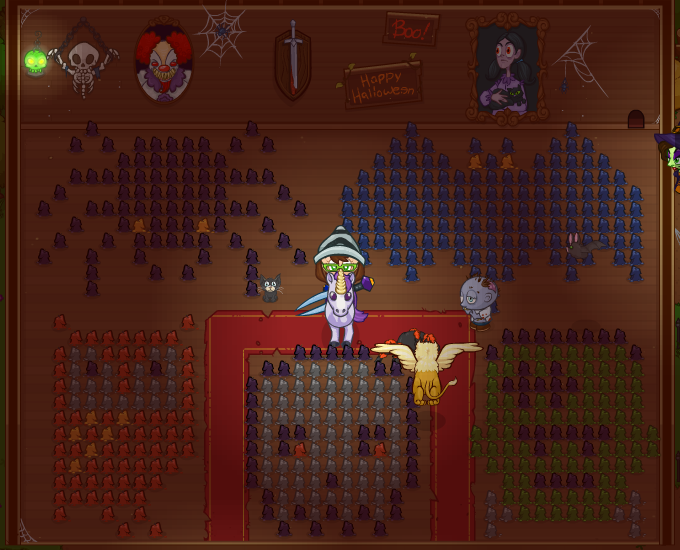 You do not have to place all your collected decorations on display in the Mansion in order for them to count towards "Hallowe'en Collector," they will count so long as they are within your haunted house inventory. Plus from Monday October 31st until the end of the event, you can hunt down denizens of Bushwhackia and Trick-or-Treat with them for Candy goodness! 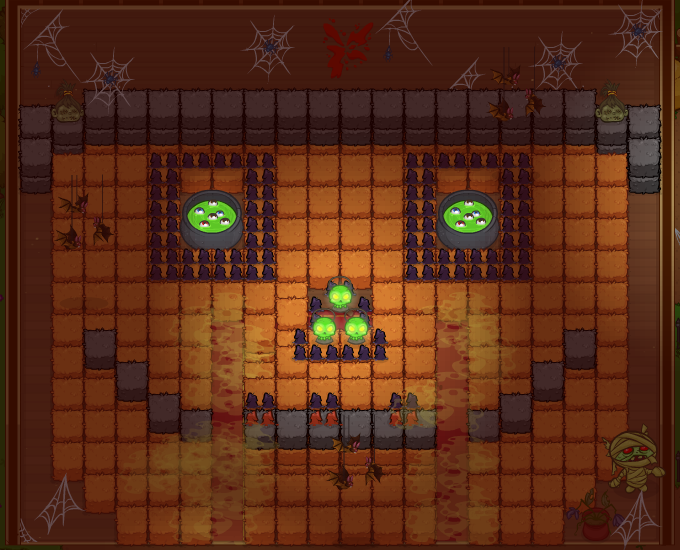 There will be a spooky character standing in front of a pile of Candy in each of the major areas! So 1 in the Mysterious Forest, 1 in the Shady Detour, etc. 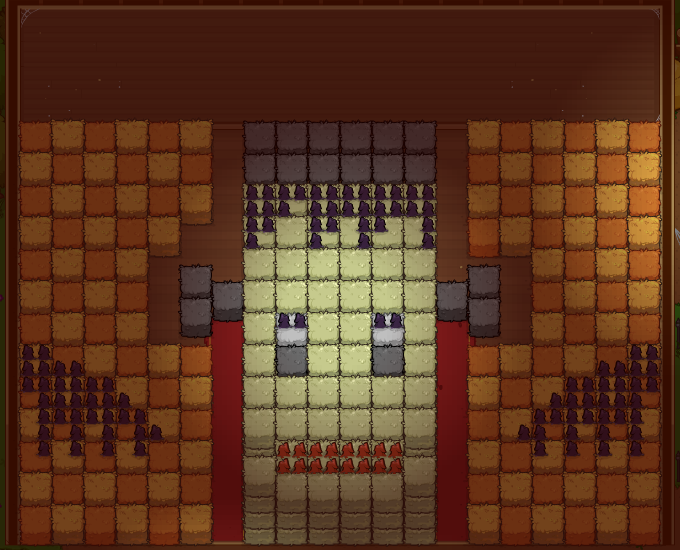 NPCs have been added up to the Spine of the World! Halloween is all about pets! We've added another quest to assemble a pet. 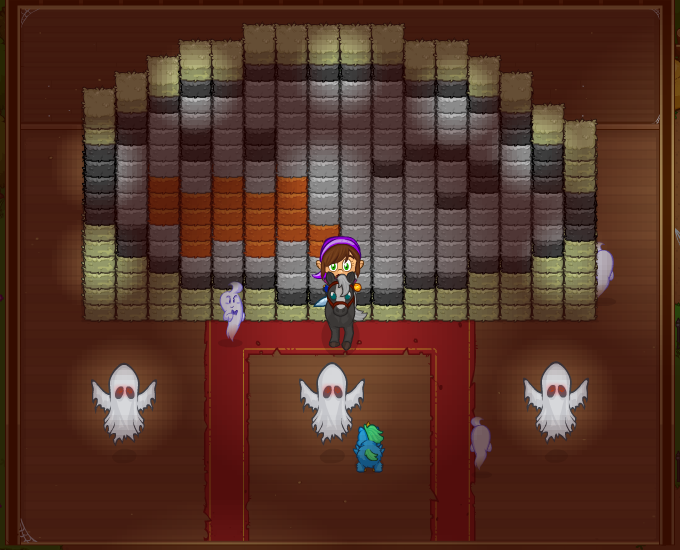 Plus, each kid will have a one-time only quest to help them, that gets you extra candy! 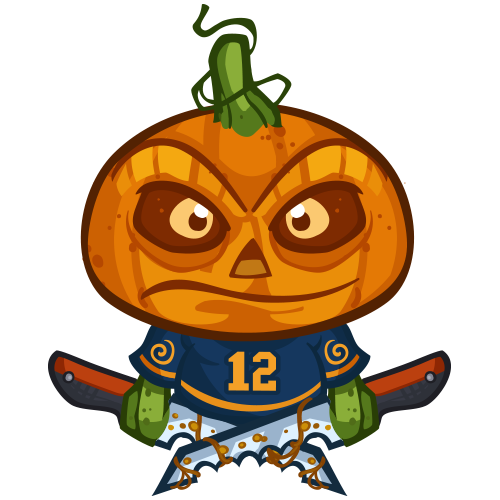 Scary Swag* - Purchase all the 2017 Hallowe'en Event items. 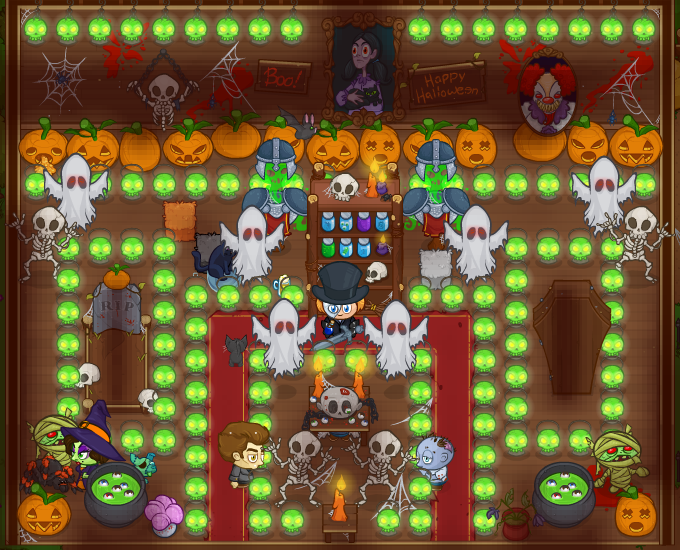 Spooky Home Decorator - get all house items from the 2012 Hallowe'en Event! 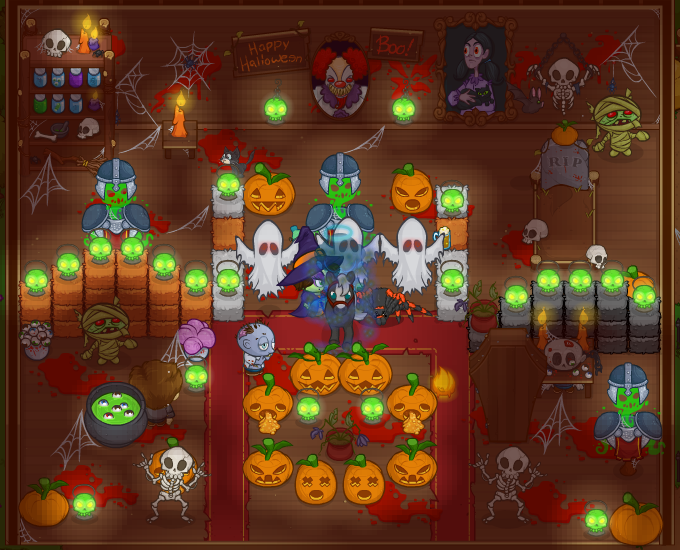 Year-round Cosplayer - Get all player items from the 2012 Hallowe'en Event! 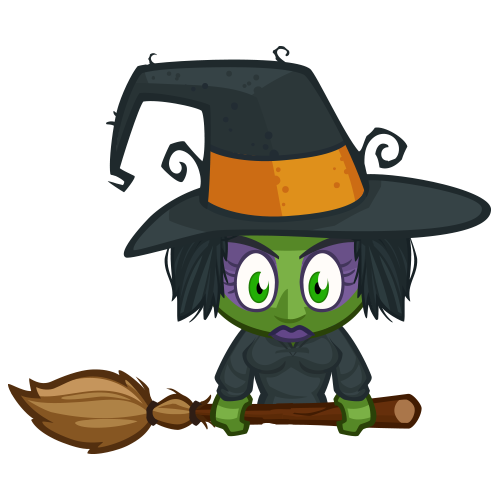 Candy Spender - Purchase all the Hallowe'en 2013 items! 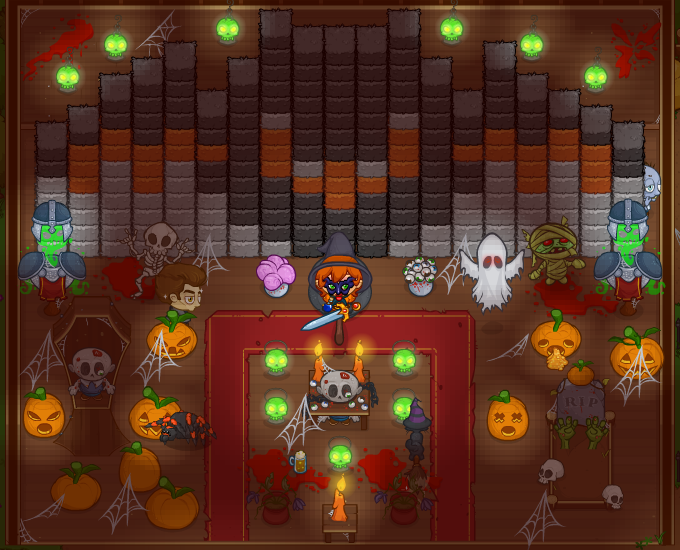 Halloweenie - Purchase all the 2015 Hallowe'en Event items. 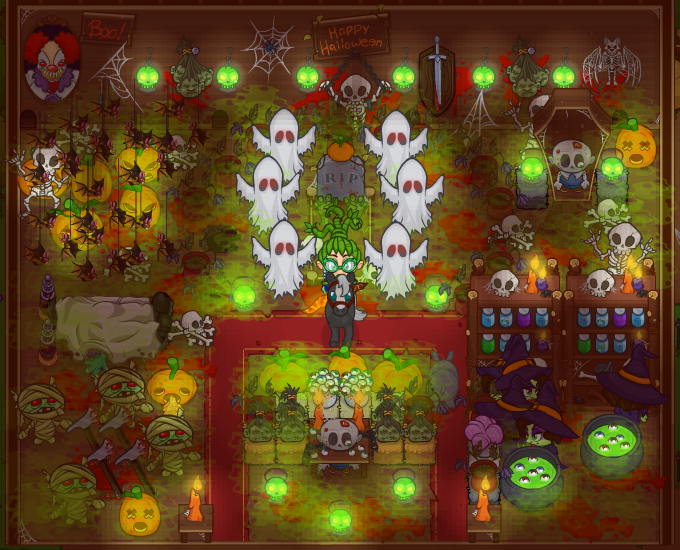 All Hallows' Items* - Purchase all the 2016 Hallowe'en Event items. 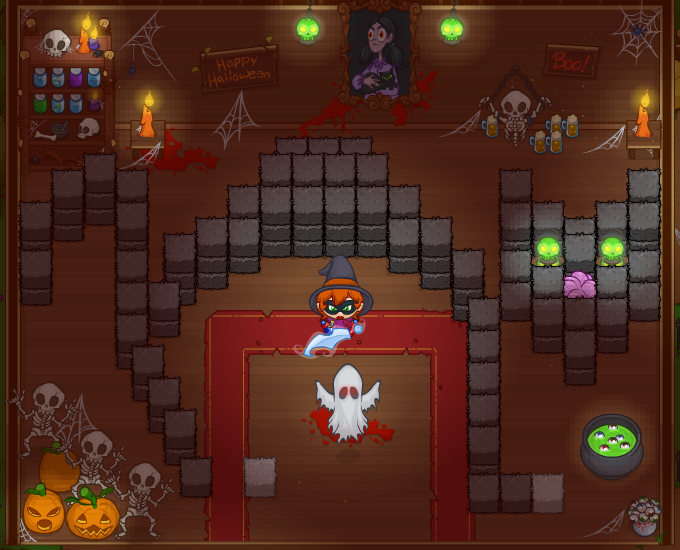 *The Hallowe'en Mini Golf piece is NOT included in the Scary Swag achievement, and therefore it is not required to purchase it. Pet Packs for 2017- COMING SOON! Post your Hallowe'en scariness and questions on the forum! The event will run until Friday November 3rd at Noon PDT! Tags: weekend, buff, Crusaders, halloween, Emo, Werewolf. 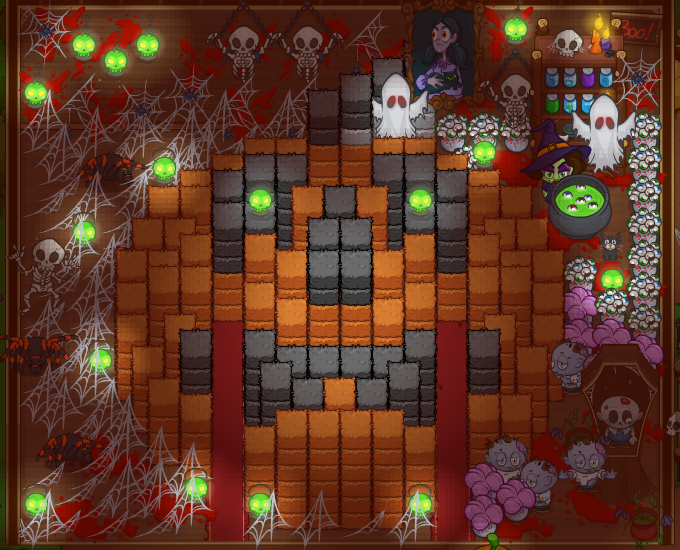 It's the Halloween weekend and what better way to prepare than a weekend buff for the five scariest Crusaders. Starting today, the five Crusaders below will receive boosts until Monday, October 31 at Noon PDT. 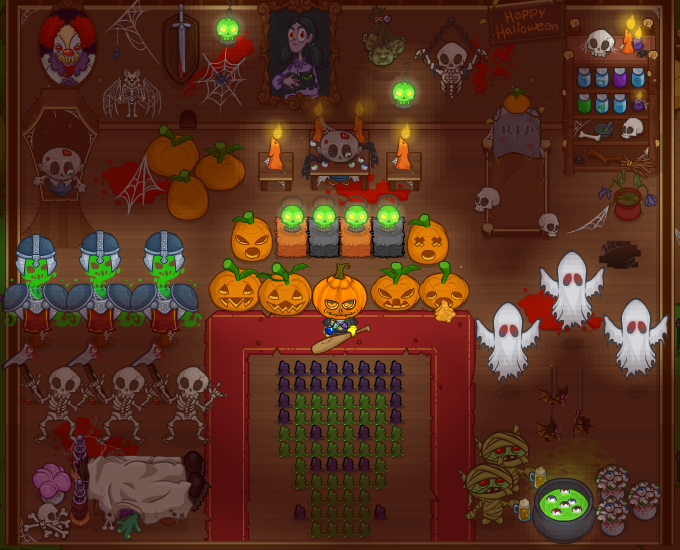 You do not have to place all your collected decorations on display in the Mansion in order for them to count towards "Hallowe'en Completionist," they will count so long as they are within your haunted house inventory. Glenda the Good Witch isn't just for buying decorations with Pumpkins. You will also be getting several quests from her throughout the event for special interactive decorations. 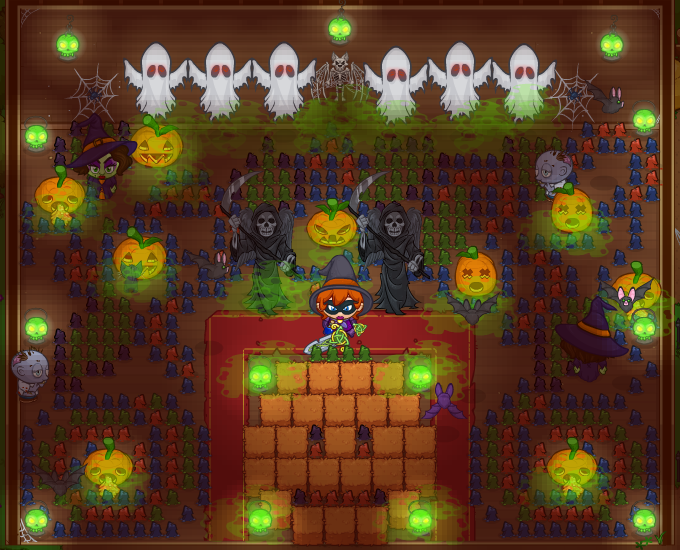 You will need all four to complete the "Hallowe'en Completionist" achievement. As you complete each of her four quests, you can request help from your friends* by talking to the Construction Worker to increase the decoration's scariness. What can possibly make your house scarier? 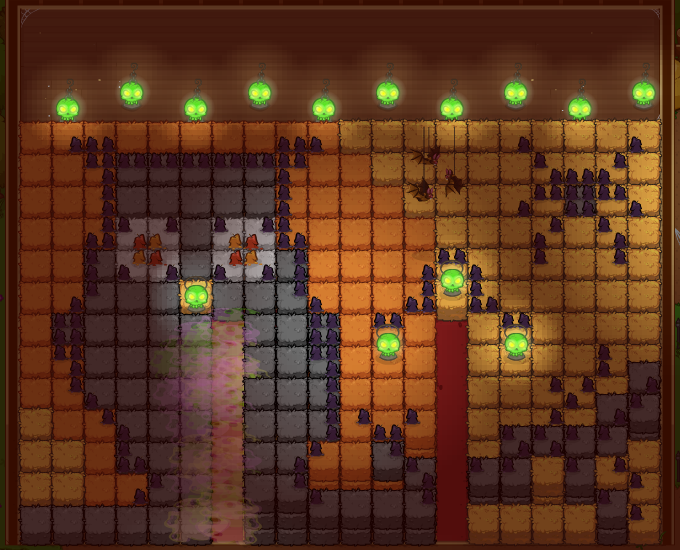 How about some Creatures which wander around your mansion! Each creature will become available for a set amount of dates which you can then request from friends* by talking to the the Cop. 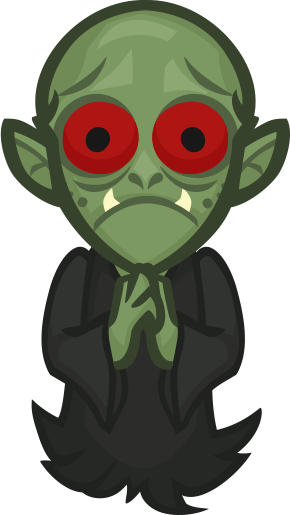 You will need one of each creature to complete the "Hallowe'en Completionist" achievement; if you miss a creature, you can still purchase one from the Cop for Bush Bucks. *Platforms which do not support Friends Lists can receive a single creature for free as they become available, by speaking to the Cop. 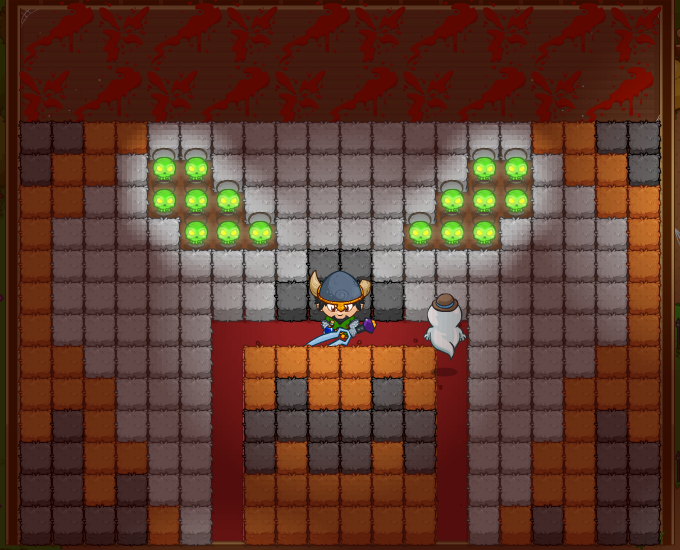 We've added a new quest to the event which will reward something players will really enjoy! Keep a look out for the 3 stages to this new quest as the event goes on! 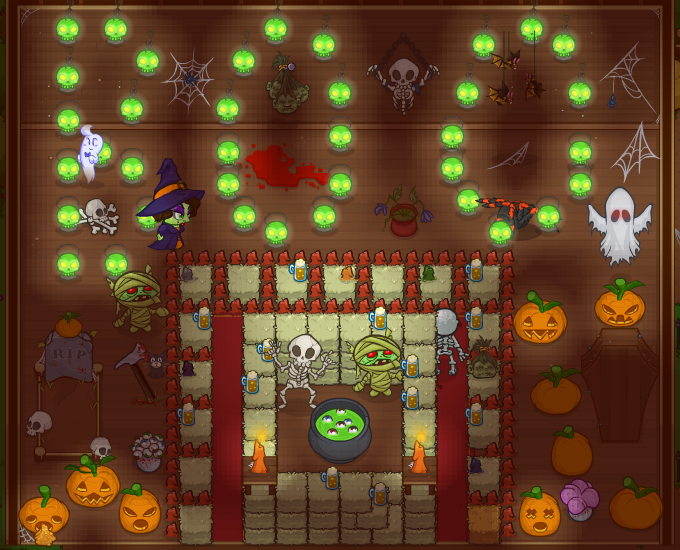 Hallowe'en Completionist - Have at least one of each decoration in your H. M.! *The Hallowe'en Mini Golf piece is NOT included in the All Hallows' Items achievement, and therefore it is not required to purchase it. Pet Packs for 2016- COMING SOON! The event will run until Friday November 4th at Noon PST! 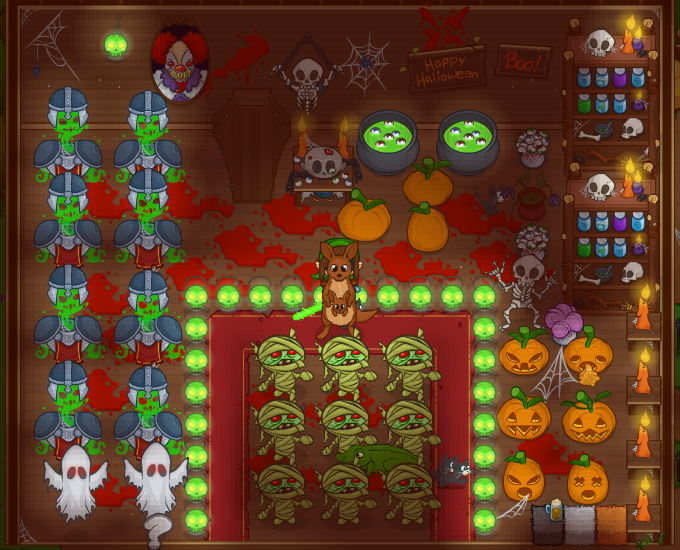 How do I get the Hallowe'en Completionist achievement? 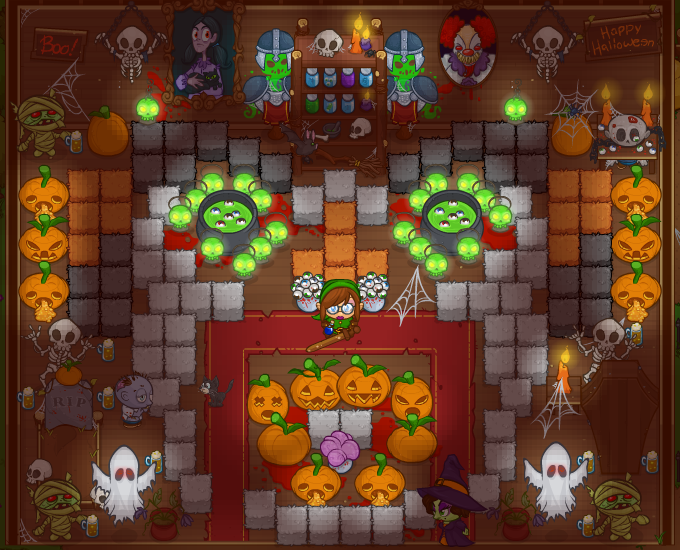 You need to buy each of the decorations available for Pumpkins, as well as make all 4 decorations that Glenda offers you along with getting at least 1 of each of the Creatures the Cop will let you request from your friends. You don't have to place them in your mansion though. Halloween is here! It always makes Emo reflective on the time he was in ghoul school. Relive his memories as he tells you the tale of what makes him emo, and tackle the 2016 edition of Emo's New Moon event! Revisit the halls of his old school and the neighbourhood he used to call home, as you help to defeat the ghouls and haunts of his past. Don't be frightened; you're likely to survive. If it's your first time playing through our spooktacular Halloween event, or if you are finishing up Tier 1 to unlock the Tier 2, you get to tackle these objectives in order to move on. The requirements needed to start them are listed in the brackets. Moonrise With Emo (100 Candies): Recruit Wendy the Witch while she debuffs adjacent Crusaders for each monster on the screen. Wendy swaps with Prince Sal, and once she's on your team, she gets DPS from having monsters on screen. 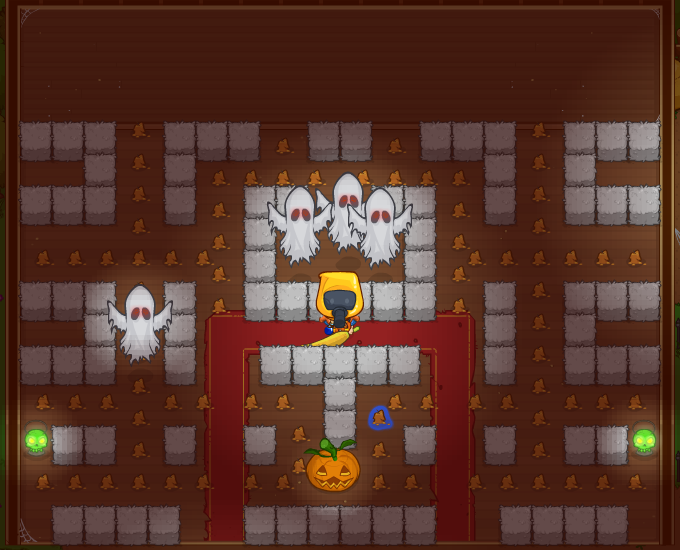 Bring Forth the Pumpkin (700 Candies): Recruit Jack O'Lantern by clearing area 100 while Jack occupies a spot and increases the damage Crusaders ahead of him take. Once he's on your team, he swaps with Natalie Dragon and gets power from tanking enemies. 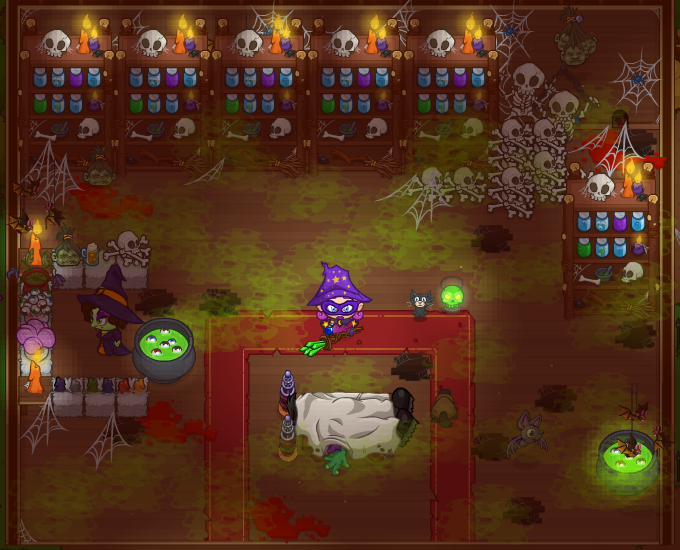 Power of the Wyrd Sister (1300 Candies, 500 Idols): Survive the onslaught of ghouls by clearing area 150 with double the enemies, double the quest item requirements and enemies dropping less gold and quest items. 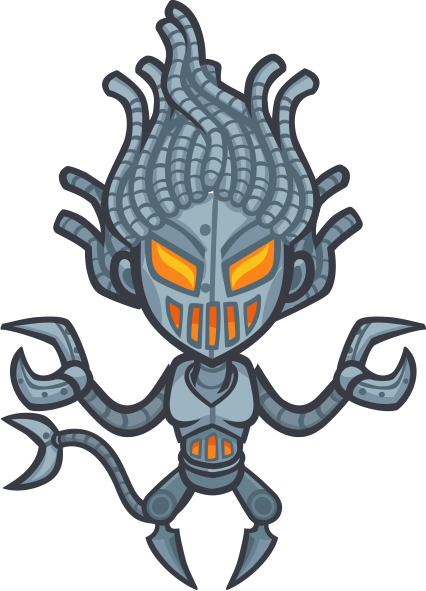 Pumpkin Spice Tanke (1900 Candies, 1000 Idols): Reach area 200 with caffeine-powered monsters who are eager to reach you and do some damage. All New! 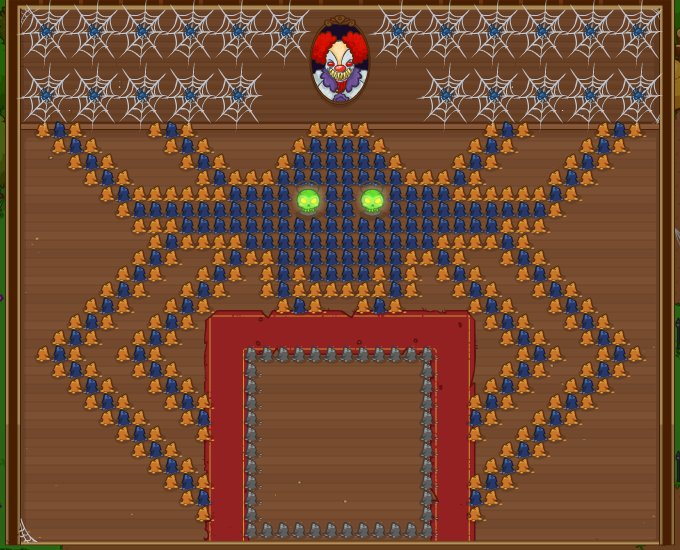 Trick or Treat (2500 Candies, 1500 Idols): Get to area 250 while special Trick and Treat monsters randomly spawn, giving you an awesome treat or a nasty trick on their demise. Note: Since the Trick or Treat objective was just added this year, players who completed this event last year will need to do it prior to starting the Tier Two objectives, so be sure to save up 2,500 Candies before resetting to start the event! Once you've completed all of Tier 1 and have the Talent "Doing It Again" from the Talents shop, you are ready to get your fright on in the new objectives added for 2016! 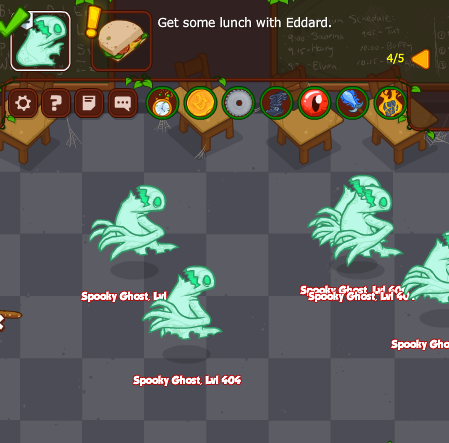 The Scaredy-Ghoul (400 Candies): Recruit Henry, the Scaredy-Ghoul to your roster by escorting him to area 300 while he occasionally gets spooked and reduces your DPS to 0. Henry, the Scaredy-Ghoul just wants to be left alone curled up in a corner with his blanket, but since you're nice enough to ask, he'll lend you his DPS power. When you swap out The Washed-Up Hermit for Henry, as long as no one is directly behind him, Henry's skill Spooked boosts his DPS by a whopping 250%. Research and Development (700 Candies): Who doesn't need more robots to keep them company? 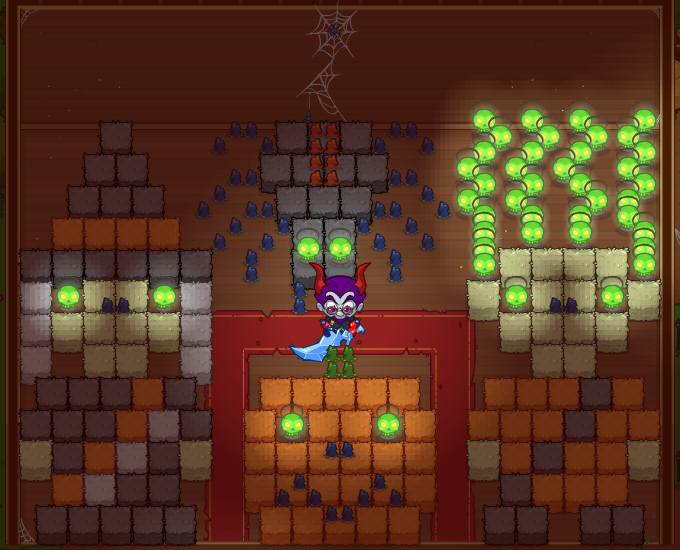 Recruit the Fright-O-Tron 4000 by escorting her earlier prototypes to area 300. Swapping with the Fire Phoenix, the Fright-O-Tron 4000 can't help being scary: it's how she was made. But she'll be supportive of your Crusaders when you use her. Oogy-Boogy decreases the maximum health of the monsters, and Remote Detonation has an explosive surprise for those looking to do you harm. Scared to Death (2500 Candies): It's your Crusaders turn to be scared by all the death they've caused. 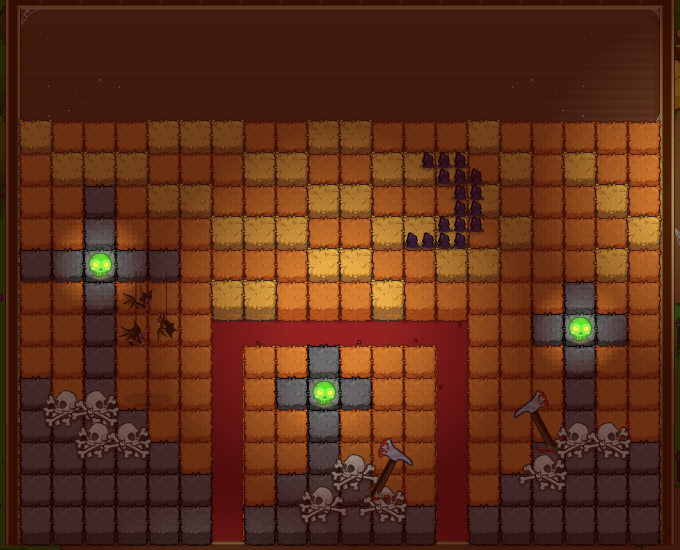 Reach area 450 with every monster death frightening a random Crusader. When a Crusader gets scared enough, they go catatonic! Halloween Hoopla (2500 Candies): The Halloween Crusaders have decided to go out and party, to get to know each other better. They've invited Bush Whacker, Khouri, Merci and Nate along for the ride, so that they can be healed while tanking and take advantage of blowing up the world when they're done. 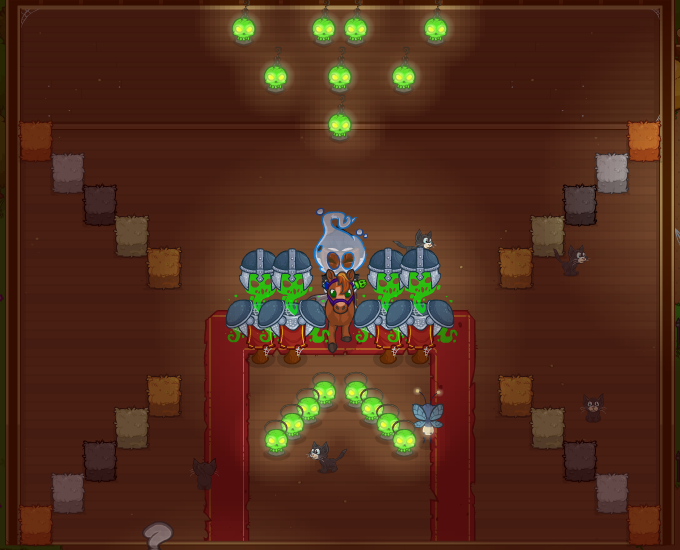 Help this party of 8 reach area 500 on your final journey of the event. Craving more candies? Don't forget that you can use Time Warps to acquire them! Good luck on your journey filled with haunts and frights! The event will run until Wednesday November 2nd at Noon PDT! Tags: bw2, halloween, contest, winners. 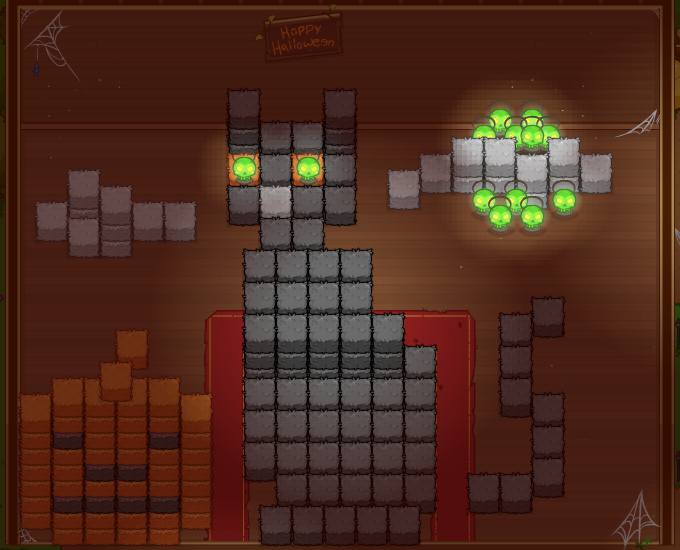 It took a little while longer than normal, but we've finally chosen our 2015 Halloween Decoration Contest Winners! If you weren't aware, the 1st, 2nd, and 3rd place winners are picked by the whole Codename Entertainment studio, while Community Choice was voted on by you, the wise whacker community! Our top three choices earn 250, 200, and 150 Bush Bucks respectively, while the Community Choice takes home a cool 50 Bush Bucks. If you want to know more about how the contest worked, click here!